The customer waiting behind me in the queue looked at me quizzically. As I walked away from the scenario I wondered if shifting between languages depending on the situation and audience is such an odd thing. Perhaps, to that lady, it was. Code switching is the name of the game: alternating between languages to suit the context and purpose of the exchange. I find myself doing this all day long. It’s a conscious active process, as I attempt to surround and immerse my son in as much Italian as possible. What we are aiming for is a bilingual child, raised in a bilingual home. Australia’s multi-cultural background is the ultimate playing ground for the establishment and maintenance of heritage and community languages at home. This is certainly the case for Italian. The post-WWII Italian migrants provided the first significant shift in the acceptance of Italian as a community language in Australia. The dialects of these migrants began the first chain reaction of Italian being spoken in the home, passed on from generation to generation. Italian speaking households in Australia are still extremely common, despite the fact that we have moved into the third generation of Italian-Australians. It’s logical to expect that the further away we move from the migrant generation, the more diluted the Italian experience will become. Irrespective of this, we haven’t completely moved away from the world of Italian dialects spoken at home with ‘i nonni, mamma e papà’. Thanks to the most recent wave of young Italian migrants, which has already proven to be greater than that of the post-War period, we are still speaking lots of Italian in Australian homes. 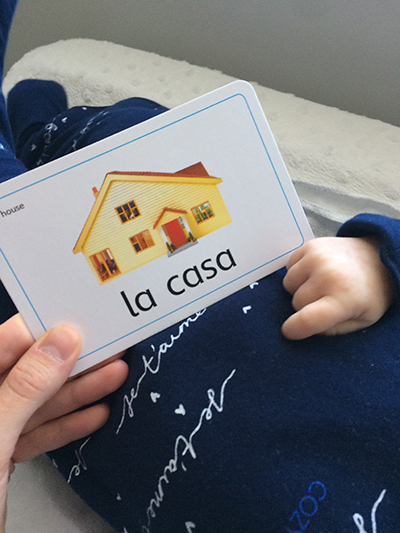 But how does one go about creating bilingual experiences in the home? Is it feasible? Time consuming? What’s the reality? It depends on many factors. What we know is that the younger you start, the greater the outcome and the easier the transition will be for the child. As language cognition develops in the brain, children are more readily able to absorb and process what they hear and experience around them. As we have often heard, their minds are like sponges. Before you can start the process of providing bilingual experiences in the home consider the kind of outcome you are hoping for. Are you hoping for the child to know key terms and vocabulary they can ‘insert’ into their daily English lives? – latte, acqua, grazie, prego, nonno/nonna; or is the goal greater fluency and the ability to converse in both Italian and English? Both are indeed enriching experiences, though the latter requires more exposure to the language, consistency and thoughtful consideration. Put quite simply: the greater the target language input, the greater the target language output. It’s very challenging, both in purpose and resourcing, to maintain that consistent input, but the effort is worth the time and energy. “English is important, but it is also important for children to learn their parents’ language. Your child will learn English faster if you speak, read and write with them in the language you know best – your home language. Speaking two or more languages will make your child a better thinker and communicator, giving them advantages at school and in life.” - Department of Education and Training, 2017. Language and culture are so deeply connected that they cannot be separated. Knowledge of languages broadens the mind and provides scope for cultural understanding and tolerance. English Psycholinguist Frank Smith said: “Language is not a genetic gift, it is a social gift. Learning a new language is becoming a member of the club – the community of speakers of that language.” Providing Italian bilingual experiences is the best way for us to ensure a continued presence of spoken Italian in our homes, as well as keeping Italian culture alive and well on Australian soil. Jenna Lo Bianco is a practising teacher with experience teaching Italian in Australia and overseas. She is a published author, language education consultant, Fellow of the International Specialised Skills Institute, and public speaker. Some of her publications include Teaching Italian the Italian way and the iCan Speak Italian digital language course by Macmillan Education Australia. When she’s not teaching or training other Italian teachers, Jenna is working on her PhD, through which she is exploring means for the protection and development of Italian language education in Australia. A self-confessed Italian-culture addict, Jenna lives and breathes everything Italian.